Yesterday, I was browsin’ the webs when I came across this recipe for black bean burgers. I was intrigued, because, even though I’m not usually interested when a vegetable pretends to be meat, this recipe actually looked pretty good. I’ll probably try it sometime soon. Yesterday, I decided that I wanted to do it with meat, anyway, because, really, it looked amazing. I had decided that it would be an excellent chance for me to practice grilling under my wonderful new gazebo, but after prepping all the meat and the fixin’s, I discovered that someone had forgotten to close the valve on the propane cylinder last time, and we were outa gas. Seriously, I don’t know who could have done such a thing. I find it unconscionable and almost unforgivable. But, we must move on. At that point, I decided to go ahead and cook them Dutch oven style, and fired up some coals anyway. The first step was to mix up the meat. This was quite simple, I mixed the ingredients in the first block all together. I actually chose the spices based on my own whims, rather than on the recipe I found. Each one was about a teaspoon, except for the chili powder, which was only a few sprinkles. My homemade chili powder is actually pretty strong. You can adjust yours to your own powders and tastes. I put the Dutch oven on the coals and let it pre-heat for quite a while. I really wanted it to be pretty hot at first. I made my patties fairly large, partly because I knew they’d have to fit on a kaiser roll, and also because I knew that they’d shrink. By the way, I chose the kaiser rolls because they are a bit firmer than typical store-bought hamburger buns. Those things are pathetic. 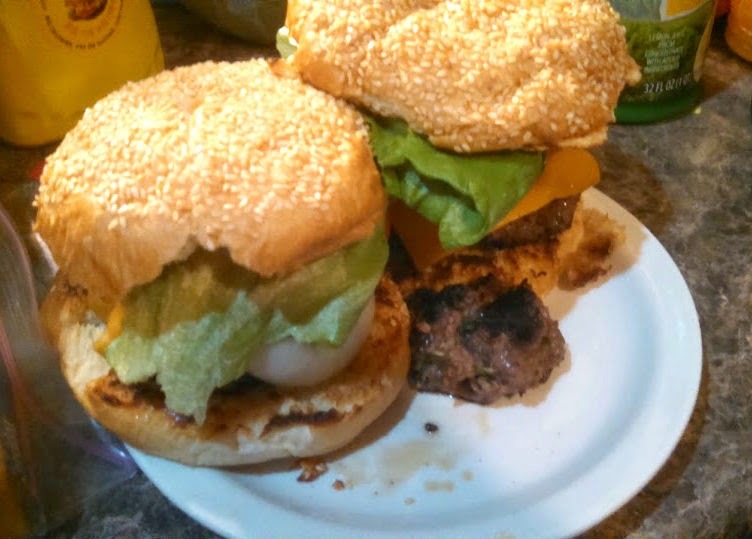 I also made larger patties ‘cause I’m a guy and I like to have lots of meat on my burgers. I know it’s not healthy, but once in a while ya just gotta live large. 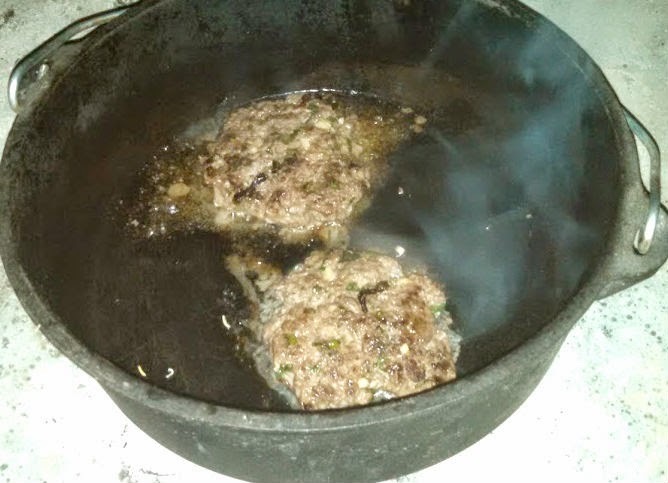 I put the patties in the Dutch oven, and used it essentially as a griddle. Because it was so hot to start with, it got a pretty good sear on the first side. While the first round of patties were cooking, I got more coals under an inverted Dutch oven lid (on a trivet-stand) and let that heat up. After turning the burgers, I brushed butter on the inside of the kaiser rolls and put them on the heated lid to toast, butter side down. After the meat turns once, and cooks a bit, it’s also a good time to put on the cheese so it can melt yummily. I was careful not to overcook the burgers. I did cook them all the way through, but not dry. It’s tricky to get to that, I think. But, it worked last night. I think the Dutch oven is not as hot as most gas grills, which helped me to not dry them out. I also think it’s very important for burgers to be topped and served the instant they come off the heat. The longer you wait, the drier and crustier they get. Not good. If you’re serving family, have them gather and pray not too long after you do the first flip or they’ll be too late. Finally, I pulled the buns off the lid/griddle, put the burger, sizzling, onto the bun, and let the family top it as they pleased. For my money, I love lots of extra stuff on my burgers, so I tend to layer it pretty high. Others might not. That’s OK. Even with the additional flavors, the spices and the flavor of the meat came through. It was possibly the best burgers I’ve ever made.